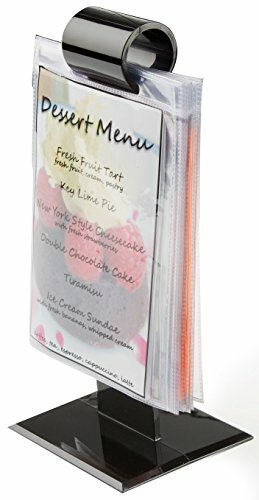 These restaurant menu holders can only be purchased in case packs of 50 units to keep price points low. The plastic table tents include ten vinyl sleeves that protect the promotions from potential damage. These restaurant menu holders have 1"d rings for convenient flipping through the various specials and items. The counter signage displays are designed for 4"w x 6"h messages, which are a common size for drink promotions and wine lists. These restaurant menu holders are crafted out of black plastic for a reasonably durable marketing tool on eatery surfaces.